For the past seven years, my race planning revolved around marathons, with 10Ks and half marathons, and the odd ultra, thrown in as preparation, finetuning, or pure fun. My training consisted of running, as did my races. I ran. Period. Choose a marathon, start specific training four months earlier. Recover at least one month. This is how I planned my seasons for the past 12 marathons, or seven years, and loved it. 2013 will be different. There will be cycling, and swimming, and yoga. And -- hopefully -- running too. For me, this year is all about Ironman Whistler, my goal race of the year, about finding the courage to start. Held on August 25, I'd like to use a 16-week race-specific preparation -- this means that real Ironman training starts on May 5. There are another 18 weeks between today and May 5. And that's a very good thing; the last time I raced, and trained, as a triathlete was in March 2005. You can imagine that both my swimming and cycling need a little work. One benefit of a temporary inability to run (I've been struggling with heel pain for six months after allowing myself to be guided into a high-intensity program too soon after my fastest marathon) is that it makes time-consuming triathlon training easier to manage; it's always good to look on the bright side of things. As of January 7, I will begin swimming with the Titans; Coach Roseline Mondor Grimm leads a masters program that involves three one-hour sessions a week. Those are held on Monday evening, Wednesday evening and Friday morning, so that's the weekly swimming taken care of. These sessions also help firm up my new weekly schedule. I don't expect to finish the one-hour whole workouts initially; the local pool has just reopened after a six-week closure for annual maintenance and upgrades. Prior to the closure on November 12, I got into the water nine times with my longest swim covering 1.5K in total. As of this week, I plan to cycle on Tuesday, Thursday and Saturday, with the latter reserved for the longer rides; those will all be done indoors until Spring, mostly on the windtrainer at home, though Tim and I also plan to accept a local bike store's offer to use its Computrainer sometimes. I first got back on my bike, on the windtrainer, on October 16, before I knew I'd sign up for Ironman two days later, as I was desperate to return to some kind of training; since then I have done about two dozen spins, though only two of those happened in December -- we were away for a couple of weeks and upon our return near-daily Bikram yoga sessions have taken up most of my time and energy. Today I did my 16th Bikram session in 22 days. Tim and I opted to buy a second windtrainer, which we did not think particularly luxurious for two Ironman triathletes training in a Canadian winter, even if only a West Coast one. Previously Tim had this toy all to himself, as I simply never used the bike I have thought of selling many times. We got a great Black Friday deal on a Cycleops Mag+ in the Western Bikeworks store in Portland (also, Oregon has no sales tax). The bike is now set up in my office, and I like the new view from my desk. I will continue doing yoga (I'll likely stick with Bikram), though I won't be going as often as I have in the past 22 days.I will also keep doing daily exercises to strengthen my feet, ankles and calves, and plan to add core strength exercises; the key is to develop a sustainable routine that is effective and time-efficient, and fits into the weekly schedule. Training is all about consistency, ask any coach. Eight months is a long time to stay consistent, so it is crucial to avoid burning out before you even get to the Ironman-specific preparation phase. In the five Ironmans I did between 2002 and 2005, I found the third month of each four-month prep the hardest to sustain and I certainly wasn't alone in the squad I trained with back then. Mental and physical fatigue can easily overwhelm the Ironman triathlete after a few months of training just a little too hard too often, breaking the willpower and ability to remain consistent in the Iron prep at a time when it is most needed. For the past six months I hung in the unpleasant no-man's land of injury, suspended in the unknown, expecting to be training and racing again "soon". Planning revolved around injury treatment, while training sessions began in hope and ended in disappointment. In August I entered an early December marathon as I believed, as did those who treated me, that surely I'd be running by then. I still am not of course but I have made great progress; I am focusing on the things I can do and plan accordingly. It has taken me a few months to find joy in training that does not involve running, but now I am grateful for the forced change in pace. Planning the athletic year ahead is exciting and fun -- I hope yours is taking shape too. Wishing you a healthy, fit, happy and inspired 2013! The fence in the backyard is progressing well. As mentioned in this previous post, I am a novice carpenter so this is easy to do. I began by cladding the front of the old 4x4 posts, which did not need replacing but were a different wood, in cedar 1x4s; once the weather permits I will paint the sides of the old posts. Then Tim and I began placing the 1x6s, three per panel. We opted to start at the far right, and spaced them 12-1/2 inches apart in height to allow for two 1x3s between each 1x6. We also chose to make them level, though the retaining wall is not; it may have been at one point but certainly no longer is. Once the first three 1x6s were in, we matched the height of each one on the subsequent panels to the left, still using the level on each. We had to cut the length of some of the 1x6x8s, and this prompted us to switch from the hand saw to the power mitre saw, a tool we have owned for at least three years but had not yet tried. It is actually very easy to use, though naturally you must pay attention and wear protective ear plugs and glasses. Once the 1x6s were in place, it was time to head back to Rona. They only had 10-foot 1x3s in stock but with the power mitre saw that was not a problem. The guys were laughing at me for building a fence in winter, though I was not alone in their lumber yard; they have been very helpful including with fitting these twenty-eight 10-footers in the Pathfinder. There is more work left to do; we need to decide how to finish the top of the fence posts, which are currently very uneven, as you can tell, and possibly add another 1x3 near the ground. Again, the cedar planks are perfectly level, the retaining wall that carries them is not. On the far right side, there is a small section -- perhaps a foot wide -- that we still need to replace; if possible we may opt for a tiny gate there to allow access to the ravine. The bigger challenge is to finish the fence on the left side as a big shed needs to be tackled first, a project we plan to attempt tomorrow. The shed, which looks more ramshackle on the outside than it is structurally on the inside, overhangs the retaining wall. It's about eight foot at the highest point. Both Tim and I have enjoyed demolishing and rebuilding the fence; as novice DIYers it is empowering to realize a project that had seemed too hard is actually quite manageable. I absolutely love working with cedar; it's soft yet sturdy, the colour is warm and diverse, and it smells fantastic. And Luka isn't complaining either, as he loved playing ball in the snow between each board going up. The past 12 months have been dramatic, to say the least. As a runner, I have enjoyed the highest highs and suffered the lowest lows. 2012, which marked my 17th year as a runner, began with a training regime I loved and responded well to, both mentally and physically. Everything clicked; I thoroughly enjoyed my training and saw the results in races, lowering my best times for the half marathon to 86:54 (from 88:13 in 2008) and the 10K to 39:39 (from 39:51 in 2008). Those PRs were simply picked up along the way to my key goal -- improving my 3:06:06 marathon, set in October 2011 when I bested another 2008 PB by 64 seconds. Consistent marathon training and racing since June 2005 paid off in May this year when I ran 3:00:29 in the Vancouver marathon, a 5-1/2 minute improvement. I was on top of the world, and I knew I could go faster. Then I made what turned out to be a critical mistake. Instead of taking my usual time to recover, allowing at least four weeks, I embarked on a 10-week running clinic that started two weeks after the marathon. It was led by a coach I was keen to work with and I was not sure if the opportunity would come around again. It was high intensity and I ran my best times for 400m, 800m, the mile and 2 miles, all within six weeks of my fastest marathon. I also raced a 10K and a half marathon. Increasing tightness turned into pain and six weeks later I knew something was very wrong, though did not yet have a clue about the extent of it. I have always been extremely careful, taking care to avoid injury. I love to run, and I want to be able to do so as long as I live. Until this summer I had enjoyed nine injury-free years, during which I raced three Ironmans, 12 marathons in 3:15 and faster, completed five ultras (one 45K, two 50-milers, and two 100Ks), and a slew of other shorter running races and triathlons; I am very disciplined and work hard at staying healthy. My success in warding off injury was part of the reason I let my guard down when I should have been most careful, and I am still suffering the consequences; I have not run for three months, and even in the prior three months my kilometres run totalled 200K at most. (That's an average of 15K a week -- in comparison, I ran at least 100K a week from July 2011 through September 2011, and again from January through April this year without any issues). I probably will not try to run again until February. An MRI in early November (there is a two-month wait period) showed little to explain the pain in my right heel/ankle. The healing procress has been frighteningly slow. It is only in the past couple of weeks that I am starting to feel a real difference; I can now walk the dog again without pain during or afterward. And I have been able to do Bikram yoga, eleven sessions in the past 14 days; at the start of July I had bought a 20-visit pass, valid until January 2nd, but stopped going as it aggravated the pain in my ankle/heel and I first needed to find out what was going on. It is only now that I can truly start to picture running again, and that I am able to see the injury may prove to have been a blessing in disguise. Bloodwork done because of my injury helped detect that my calcium was low, so I am now taking a supplement to boost it. The results also prompted my GP to recommend I take vitamin B12 and D and magnesium. (My iron levels were excellent, however). To help the healing I also made significant changes to my diet, cutting down on caffeine, alcohol, sugar and gluten, while boosting the amount of veggies and fruit. Bread and pasta formed a huge part of my diet for years and nearly eliminating them has been enjoyable so far, even if a little challenging at first. In October I signed up for Ironman Whistler 2013 because I needed positive motivation to swim and cycle again for the first time in more than seven years, cross training that I have been encouraged to do while the injury heals. I doubt I'd otherwise have entered what will be my first Ironman in 8-1/2 years. And by now I am excited about it, even if still scared too. With the help of Tim, who gave me some fantastic workouts, I returned to the pool and found that I did not drown, even actually enjoyed swimming again after such a long layoff; freestyle has never been my forte. I am now comfortable enough to join the Titans' masters swim program, which offers three sessions a week; in fact, my first race of the season might be a swim meet -- gulp! -- on February 24 in Vancouver with the club. I had hoped to start 2013 with the First Half Marathon and have until January 9 to accept a spot, but that is not a good idea, as tempting as it is. Meanwhile, spinning on the wind trainer has also proved a welcome outlet for pent-up energy, and the Argon 18 Platinum and I have reconnected on short easy sessions of between 30 and 60 minutes so far. The injury has forced me to work on strength and flexibility, and I can only benefit from this. The postures in Bikram confirm I have plenty of tightness, weakness and imbalance; they are pretty good at pointing out their exact location too. This also confirms, indeed strengthens, my belief that I can improve all the personal records I set this year with a stronger, more flexible and balanced body. I hope to do another five Bikram classes before the end of the year to finish the remainder of my pass, and I certainly plan to incorporate this or another type of yoga in my training regime in 2013. Also part of my new rourtine are specific exercises for my feet and ankles. My supportive sponsors Drs Paul Fleming and Leah Stadelmann have provided me with great strengthening exercises for my foot, aside from a slew of treatments, while Australia's Dr Daryl Phillips, the first ART therapist I ever saw because of an ITB injury in 2003, has given me superb ankle-mobilization exercises. I thank them for their ongoing support, which has been much appreciated. A sports med specialist in Vancouver told me that calf raises were the key to my return to running; when I last saw him on December 12, he gave me a concrete goal; when I can do three sets of 20 single calf raises with fast drops without pain, I can try a run. He estimated it might take me six weeks. He also recommended I learn to balance on the ball of each foot for 30 seconds. The No. 1 priority remains a return to injury-free running, period. For now, it is about Bikram, swimming and cycling, strengthening, and mobilizing. And calf raises. The week before Christmas might not be the time most people choose to demolish and rebuild a backyard fence. But that is exactly what I am in the process of doing. Our house was built in the 1980s and presumably the fence was too. 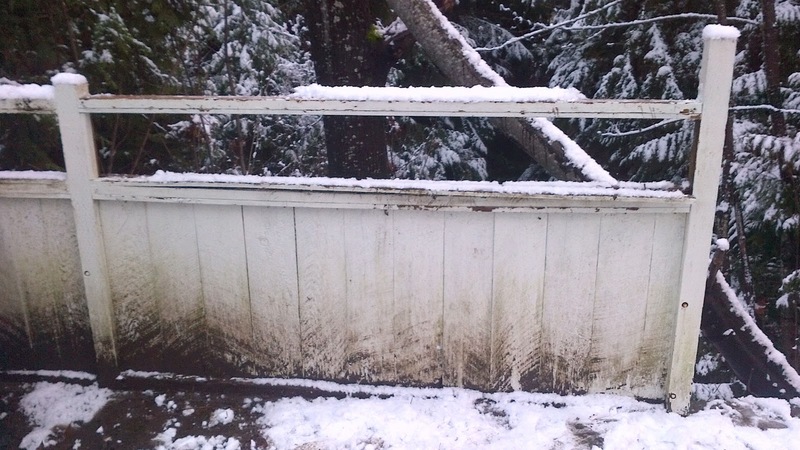 The wet West Coast climate takes a toll on wood and the property's fences were looking tired by the time we bought the place four years ago. A coat of paint would help, we thought. So I painted the 60-odd feet of wood panels about three years ago. It improved the look a little but not enough, and it certainly did not stem the rotting. Last year we removed the lattice from the top panels where it had not already fallen out on its own. A cleaner look perhaps but, again, far from enough. The whole backyard needs work. Tim has spent much time and effort trying to turn the clumps of green and dirt into proper grass, including dethatching it, but so far it has not turned into the sea of lushness we had hoped for. There is also an old shed that has seen far better days, and it is waiting to be demolished to make room for a nice patio. Our dog, Luka, loves to play ball in the backyard which I am sure has not helped the condition of the "lawn", as he slides after his toys to fetch them. I recently read the term "pet-scaping", landscaping with your dog (or pet) in mind, something that I'd like to look into next spring. This summer we got a quote to redo all of the property's fences and building some new ones and, not surprisingly, it was pretty expensive. We have plenty of other projects that are screaming for funds so it is a matter of prioritizing. In the meantime, we had been keeping an eye out for fences we like. Tim and I both like clean, modern lines. Horizontal boards provide that look. Our backyard is about 65 feet wide. It's deep too, though a large part is taken up by a steep ravine that houses plenty of tall trees. The back fence, which sits on top of a retaining wall of about 4-1/2 feet, is there to keep bears out of the yard, and Luka in it. As we have found, a bear has no problem jumping our fence but at least there is an extra hurdle. Privacy is not an issue, and we like the green outlook. As another summer came and went, we were too busy with other things to tackle the fence issue. Tim and I both signed up to do Ironman Whistler in Canada next August, which there means will be little time for big home projects in May, June, July, and August of 2013. A new fence would stay on the to-do list another year. Or so we thought. Last Friday, December 14, proved a fantastic sunny day. Perfect conditions to get rid of that hideous fence; I was suddenly completely tired of looking at it -- we see it from the kitchen, Tim's office and the dining room. Tim was initially not enthusiastic about my plan; he did not want to be without a fence for months. What was I going to replace it with, and when? My initial plan was a temporary solution, using a 50-foot roll of 4-foot-high multipurpose fence attached to the existing posts with large ties, which would be a relatively simple and easy job. After a little discussion, he agreed and I set about removing most of the panels, initially six 8-foot ones. It took me 3-1/2 hours of solid work, using both sides of a claw hammer, a hand saw and a square-tipped screw driver; the time included piling the wood in the shed. Tim went out to get some large ties to attach the new fence, which we planned to do the following day as darkness arrives before 5pm at this time of the year. At night I decided to look into lumber, check more modern fence pictures, and before long there was a new plan: a modern wood fence, either pressure-treated or cedar. After a Saturday trip to Home Depot where the sizes in stock were not the ones I had in mind, I went to Rona on Sunday while Tim was at a bike store. Plenty of cedar 1x6x8 planks at $5.49 each. They also had 1x4x8s, but were out of 1x3x8s, though those could be ordered and arrive in five days. No 1x2x8s. We had decided to keep the old 4x4 fence posts to keep the job manageable; they're still sturdy and anchored to the retaining wall. Besides, they are conveniently more or less 8 foot apart, measured from mid-post to mid-post. To improve the look, we decided to clad the front with a 1x4; in spring I'll probably paint the sides of the post in the same white as the trim of our house. For the fence panels I decided to use three 1x6s, and then add two 1x3s between each to add some visual interest, while keeping the design simple. I have never built a fence and am a novice carpenter, after all. Gaps of 2-1/2 in between each board, plus the size of each one (all half an inch shorter than their names, i.e. a 1x6 is really 5.5 inches wide) plus a 3-inch gap from the retaining wall will add up to a height of about 47 inches. Perfect. Back to Rona with the plan. Once Tim and I loaded the Pathfinder with 18 1x6x8s and 7 1x4x8s, it was full enough; we picked up screws and paid a total of $148; the 24 1x3x8s we'll pick up later will add another $100. Not bad for a 48-foot cedar fence. 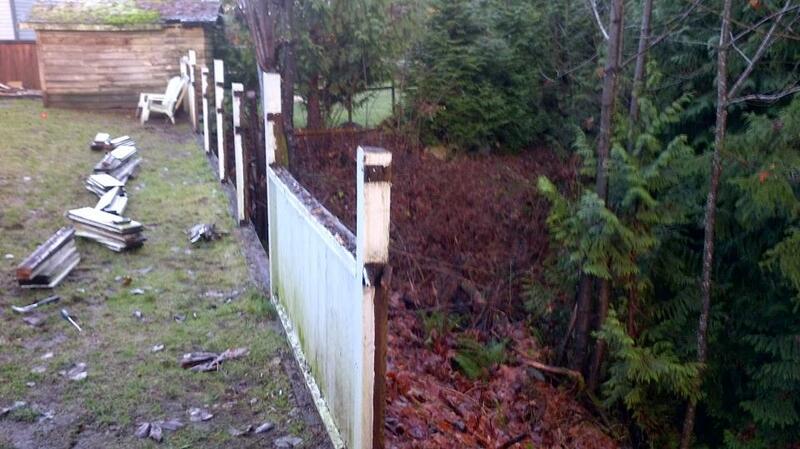 The first task was to cut the 1x4x8s to size; the existing fence posts are all a different height. I ran each new cedar piece along a post, marking the desired height with a pen, and then brought it back inside to hand saw it to size. To avoid splitting, it helps to saw both sides of the board. My rather basic "work bench"
This process for seven 1x4s took less time than I thought, and screwing them onto their posts was easy; cedar is a soft wood. I only used two screws, one near the top and one near the bottom, as there will be more once the horizontal boards will be screwed into the cladding and post. The following day Tim helped with the two-person job of getting the 1x6x8s onto the posts, using screws, square screw driver, level, and a measuring tape. Work is progressing well. Four panels are now in place, which will later get the four 1x3s -- two between each 1x6, and possibly another 1x3 near the bottom; the boards are level, the retaining wall is not. Holiday souvenirs for me typically include books and stones; and the latest travels were no exception. Tim, Luka and I just got back from a 16-day holiday / road trip of more than 4000K that took us to California and Oregon. The main purpose of the trip was the California International Marathon, for which we both had registered. We had entered in September for this popular marathon that runs from Folsom to Sacramento, as I was then still optimistic I would be back running "soon". We had considered flying to Sacramento for a long weekend but decided to drive so we could take the dog and see more of northern Califoria and southern Oregon, places neither of us had been. We took three days to make our way to Auburn, where we had rented a place for the week. Both Tim and I still had to work, and this made a good location to get to the marathon start on race morning. Auburn is, of course, where the Western States Endurance Run finishes after beginning 100 miles earlier in Squaw Valley. A little ironic to stay there on a trip for which I did not even bother to pack my running shoes, as I could not use them anyway because of my injury that's now approaching six months. On the way back north we had opted to stay for four nights at a stunning place near Port Orford on the southern coast of Oregon. Driving there from Auburn, we passed through the magnificent Redwood forests in the torrential rain that had been with us for the previous five days. We stopped at the visitors' centre of Humboldt Redwoods State Park; this is where my souvenir gathering began. Among the neat things the centre offered was a solid selection of books; Stories in Stone was a title that caught my eye immediately. In the preface author David B Williams writes, "[W]herever I am in the world, whether strolling through downtown Boston or hiking in the Northern Cascades, rocks are the first thing I see." On sale at $9.95, this hardover edition subtitled Travels Through Urban Geology had to come with me; as a kid I was already enthralled by rocks, and still am today. After majoring in geology, Williams moved to Southern Utah, a great base for his explorations around Moab, "a geological paradise" he had to leave when his wife opted for a master's degree in Boston. "I hated the first few months," Williams writes. "Where I had once traipsed through quiet sandstone canyons, surrounded by thousand-foot-tall cliffs of rock, I now walked through shadowy canyons created by buildings. Where I once hiked on desolate trails, I now crossed busy streets. For the first time in many years I felt disconnected from the natural world." But he found a new way to connect in Boston's buildings. "Half-billion-year-old slates abutted 150,00-year-old travertines. Metamorphic rocks interfingered with igneous rocks. Fossil-rich, sea-deposited limestones juxtaposed mineral-rich, subduction-created granites. Plus, builders had gone to the effort of cleaning and polishing these fine geologic specimens, making their stories much easier to read. "As I began to notice the stone in buildings, I found the geologic stories that could provide the connection to wildness I had lost." Keeping an open mind to a change in life that at first seemed undesirable can lead to a new passion, or a new way to practice a long-held one. I am looking forward to reading Stories in Stone which, he writes, "offers readers a new window through with to look at urban landscapes. Intriguing cultural and natural history stories are no farther than the nearest building." Another title jumped out at me, The Wild Trees by Richard Preston, a book about coast redwood trees, "the largest organisms the world has ever sustained". According to the book jacket, "Preston unfolds the spellbinding story of Steve Sillett, Marie Antoine, and the tiny group of daring botanists and amateur naturalists who have found a lost world above California that is dangerous, majestic, hauntingly beautiful, and largely unexplored." This $16 paperback came too. Next up in terms of souvenirs were the beautiful rocks at the beaches near Port Orford where we stayed for four nights. Luka was thrilled to chase his ball in the sand, while Tim and I looked for natural treasures. We drove home via Portland where Tim took Luka for a walk as I went to Powell's City of Books -- ahh, paradise can be overwhelming! I had half an hour, which grew to 45 minutes, and I had to make some quick decisions so I focused on one area: writing / reference as I wanted to get a copy of the latest Roget's International Thesaurus. Once I had that (hardcover edition for $12.93), I also brought: Thinking on Paper: Refine, Express, and Actually [really, actually in a title for a book on writing?!] Generate Ideas by Understanding the Processes of the Mind by VA Howard and JH Barton. A whopping $6.95 for what I think will be a great book. Inventing the Truth: The Art and Craft of Memoir edited by William Zinsser was also an easy choice ($7.95). Lee Gutkind's 2012 You Can't Make This Stuff Up: The Complete Guide to Writing Creative Nonfiction From Memoir to Literary Journalism and Everything in Between was my most expensive purchase at Powell's for $16. Natalie Goldberg's Old Friend From Far Away: The Practice of Writing Memoir came too for $7.98, as did Walter Mosley's This Year You Write Your Novel at $4.98. The last one I was least sure of bringing, but I did for $9.95: Martin Manser's Collins Dictionary for Writers and Editors. Earlier this year (in early September) I applied to the Master of Fine Arts in Creative Writing optional residency program at UBC. I was cautiously optimistic about my chances of being accepted, though only about 20 to 25 percent of applicants are. Alas, I just found out that the writing I chose for my portfolio did not make the cut for the 2013 program. And I am very disappointed indeed. But that's life, and there is nothing I can do about it. It was, however, an encouraging rejection as my portfolio made the shortlist. "This list consists of approximately 40% of the applications received and manuscripts on the shortlist are those which our faculty feel have a great deal of promise. From this shortlist, the smaller acceptance list is generated," according to UBC. "Our decision definitely does not close the door to another application at a later date, and indeed we encourage shortlisted students to reapply. Every writer grows by revising old work and writing new material. Should you wish to try again, we would welcome your application; to make this easier we will keep your transcripts and related application materials on file for one year." I will probably apply again next year. Unfortunately, even though understandably, there is no individual feedback on the writing submitted so I do not know which parts were considered strong and which were judged to be weak. The rejection motivates me to work even harder on my writing. And I have a great opportunity to do so in the next four months. This mentorship runs from January through May, and I am very excited to be working with Claudia Casper on my manuscript during this time. I am very serious about writing; and I take heart from the lessons learned as a runner. If you set your mind to a goal, you can do it -- you simply need to keep at it. It has taken me 16 marathons to approach my dream of running a Sub-3 42.2K, and this year I finally got close enough to know I can do it. The injury that has halted this progress for the past six months, and still remains to be solved, has only served to motivate me even more. Writing is more important to me than running. It is harder too. My ultimate goal as a writer? I just want to write a damn good book, and then improve in the next one. A more measurable goal for now is that I would like to revise (most likely completely rewrite) the manuscript with the working title Out in the Wilderness under Claudia's guidance in VMI 2013, then seek publication through a traditional publisher for the first time. I want to run, and I want to write, and I always seek to improve in both. Life is as simple and as complicated as that. In May I wrote about a stranger who took this picture of me during the 2012 Vancouver Marathon at about 28K and then was so kind to track me down via email to send it to me. He also told me he was not a runner; he had struggled to cover 9K the other day. "Anyway I love taking photos of people running and the determination of the runners is very inspiring, especially the ones who run the full marathon." He responded a couple of days later saying he had just registered for his first running race ever, a 10K the following month. I asked him to keep me posted. As I told you earlier and thanks to you, I ran my first 10K race last Friday. It was a bit weird to run in the evening (especially after a rather long week at work); I was a bit worried though I had run 11k in the previous weekend to earn some confidence. The run was great and surprisingly I made it in 51 minutes! I managed to keep my pace steady and didn't feel exhausted after the run. Thank you very much for the inspiration! I have no plans for [races] any time soon but I set my goal to run a half next year. As today is my 43rd birthday, I was thinking of the past year of my life and realized that running was the most exciting achievement. Thanks to you, I started to run and joined races. This summer I ran another 10k -- with a bit over 47 minutes but my biggest achievement came at the end of last month [September] in Surrey. I did my first half marathon (with a proud speed of 1 hour 43 minutes 27 seconds) and most of all I enjoyed the run. I am going to sign up for two half-marathon races next year and see how it goes. Anyway thank you very much for inspiring me to run. Congratulations Kangsoon -- a 1:43 half marathon is an accomplishment every runner would be very proud of, and to run that in your first one is even more impressive! I am not interested in trying to convince people who do not want to run that they should; but when someone does show an interest and appears to be looking for a little encouragement, it never ceases to amaze me what novice runners (even those who would not yet dare to call themselves a runner) find they can do. You are inspiring Kangsoon, and I wish you an even more exciting 2013 season. Runners all ages, shapes and sizes pass by my window daily. Some have chosen company, others opted for solitude or a rhythmic technological companion. I watch them, scanning their faces and body language for signs of the rapture I am missing so much, and wonder when, if, I'll be able to join them again. This Tuesday I am getting an MRI at St Paul's hospital in Vancouver, a request made by my GP eight weeks earlier. However, the physician I saw at the go-to sports medicine clinic in Vancouver told me two weeks ago he doesn't expect the MRI to show anything to help explain my injury. Both good and bad news, if he's proven right. For now, I don't expect to run again this year. In October I ran once, in September four times (all therapist prescribed) -- short easy jogs, interrupted by walks, and all ending with the same conclusion: whatever my problem, it certainly hasn't been solved. Mentally managing the uncertainty of a long layoff from running -- my first in the 17-year-long lifespan I have as a runner -- and the worry that I might never be able to run again, let alone train for a Sub-3 marathon, has become the priority. Self-awareness plays a key role. I know what motivates me just as I recognize what typically causes me to procrastinate. There's no rocket science to it; I simply need a goal that excites me, something I can sink my teeth into, something that scares me a little (or a lot). It's usually something that requires commitment and immediate, but manageable, action. Intuition is another important ingredient. Several of the books I've read recently cite research by Dr Candace Pert which proved the scientific truth behind the saying, "Go with your gut." "The work of Pert and her colleagues showed that a variety of proteins known as peptides (including endorphins) were among the body's key 'information substances'—and each of them could affect our mind, our emotions, our immune system, our digestion and other bodily functions simultaneously,'' according Paul Trachtman's review of Pert's book Molecules of Emotion: The Science Behind Mind-Body Medicine (1999) for Smithsonian magazine. Having read about the science behind the value of 'hunches' helped me trust my intuition to sign up for Ironman Whistler last month, even though I had thusfar felt completely unmotivated to swim or ride as cross training, as was recommended to me. Indeed, it helped me trust my intuition to sign up for my first Ironman since finishing Ironman New Zealand in March 2005, because I had thusfar felt completely unmotivated to swim or ride as cross training. I hoped that committing, at least financially, to this big scary goal would give me a reason, a positive reason, to return to swimming and cycling; I'd swim and cycle to get ready for Ironman, rather than only because I cannot run. Big mental difference. I knew that riding on the windtrainer, as I will be doing until Spring next year, will simply be a matter of doing it, taking the time to slowly build that bike fitness from scratch. That also means I have plenty of time to search for a strategy that will help me overcome my fear of riding downhill; being able to train on the Ironman Whistler course regularly should help. Returning to the pool was a different matter altogether. While I have a decent breast stroke, I had to learn freestyle when I started doing triathlons and it was a long hard slog. In my first Ironman in Forster-Tuncurry, Australia, in 2002, I swam 1:19:27. The following year, I came out of the water in 1:17:16, before swimming 1:20:20 in 2004, though that year wetsuits weren't allowed because the water exceeded 24 degrees C.
Several months after completing my third Ironman Australia in April 2004, I did Ironman Frankfurt. The swim was awful; I finished it in 1:18:55. The next goal was Ironman New Zealand in March 2005, and I worked very hard on my swimming with plenty of drills, which finally paid off with a big PB swim of 1:13:35 in Taupo. That's also when I stopped swimming, as I opted to focus on running instead. Two weeks ago I did my first swim training since March 2005, and was very relieved to find that I could at least cover the 25 metres of one length of the Squamish pool. I even sort of enjoyed it. Triathlete Tim had given me a workout that only included 25s, and those felt manageable. I have swum five times now, and the last two workouts prescribed by Tim added up to 1.3K each and included two 100s. There's a long way to go before I'll be ready to swim 3.8K but it's a good start. I want to get a few more swims in this week as unfortunately our pool will close for six weeks as of Nov 12 for annual maintenance. I have spun on my bike 10 times in the last 2-1/2 weeks, beginning with easy 30-minute rides to ease into reconnecting with my inner cyclist again. 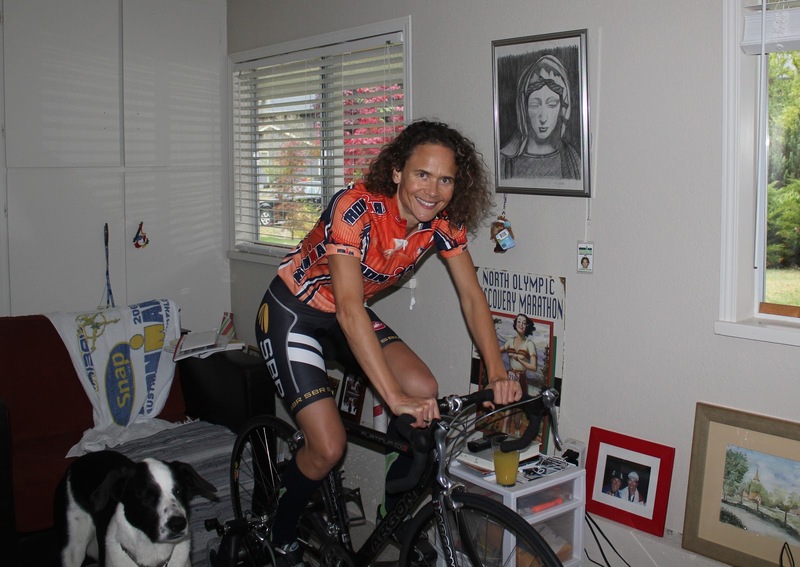 I am enjoying it, and today I did my longest spin yet at 60 minutes. I know that the hardest work ahead of me on the bike is the mental challenge to ride on the hilly course, but that won't happen until winter gives way to spring. To help build upper body strength, and leg strength too, Tim and I have started going to a local gym where we're following a routine we've done before from Start to Finish Ironman Training: 24 Weeks to an Endurance Triathlon by Paul Huddle, Roch Frey, and TJ Murphy. As I have slowly started the preparations for a return to Ironman, I thankfully no longer wake up in the middle of the night with a brick in my stomach wondering what on Earth I have gotten myself into, as I did the first couple of nights following my entry. It also helped that Tim, a 10-time Ironman finisher with a 10:09 PB and a Kona finish, told me he still feels scared signing up for the next one. By now, I am excited about the training ahead. I have a positive reason to exercise, which I love and need, as I seek the answer to my running injury. Perhaps I have already found it. As part of my ongoing battle with a mysterious heel/foot injury, I am doing a seven-day cleanse this week. I am enjoying it so much that it may well become my new diet. I use the word "diet" in the sense of nutrition, or the sum of food (and drinks) I consume; I am certainly not trying to lose weight. Encouraged by my supportive sponsors Drs Paul Fleming and Leah Stadelmann of Chief Chiro (which recently joined forces with Squamish Therapeutics to form Squamish Integrated Health) I looked into the inflammatory qualities of food and decided it was time to adjust my diet accordingly, particularly when it came to bread and pasta, of which Tim and I have been eating copious amounts for years. 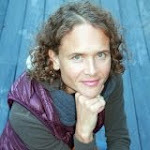 In the past 18 months, Tim and I had made some key changes to our diet inspired by my work with Teresa Rider on her book Reconnect With Food: Eat Your Way to Triathlon Success and a subsequent IMJ Coaching training camp run by Teresa and her husband Scott Jones in Boulder, Colorado. The two key nutritional changes we made as a result was our daily breakfast and the meat we eat most nights. Breakfast changed from Alpen no-sugar-added cereal with milk, to a homemade Bircher muesli, while the meat we eat most often changed from lean beef to buffalo (both the mince and steak varieties). Another key change was using extra virgin olive oil and balsamic vinegar for salad dressing, rather than the low-fat ready-made bottled Italian-style dressing. But now, as I desperately search for a solution to the problem that is keeping me from running -- something that has affected me deeper than I allow myself to realize because it's too hard to deal with -- I have revisited my diet again and am making some more changes. The Squamish Public Library has a copy of Anti-Inflammation Diet for Dummies in which I learned more about the impact food has on the level of inflammation in our body. I haven’t yet read the entire book but the sections I have provided an incentive to act. It may have a positive impact on whatever my running injury is and at least, if nothing else, improve the way I fuel my body. This book also mentions this website where you can check the Inflammation Factor of a food. Recently I came across this article about foods that ease muscle and joint pain, and have since made an effort to include one of them in each of my meals, which is not hard to do. They include cottage cheese, ginger, turmeric, kale, walnuts, and extra virgin olive oil (I was using the latter already but have become more generous with it). Scanning Quantum Wellness: A Practical and Spiritual Guide to Health and Happiness by Kathy Freston, chapter five titled A Jump Start for Your Body: Doing a Cleanse caught my eye. "Of course the bedrock of wellness is feeling good in your body and being aware of what helps and hurts it, and one of the best ways I know to jump-start the process of feeling good in your body is through a body cleanse," Freston writes. "A cleanse is a short-term fast, during which you give up certain foods (or sometimes all food) for a period of time." "It's not just good for the body, it's also a very important part of a general clearing and lightening that can have a considerable effect on our moods, our outlook, and our sense of spiritual connectedness. Again, this is all about body, mind and spirit. They rarely act or react alone." The cleanse is aimed at giving the body a break from all the hard work of digesting our food. She recommends giving up sugar, alcohol, caffeine, gluten and animal products. I opted to give up four of the five for one week, though with caffeine I have kept one cup of coffee in the morning (that's down from my usual 3-4 cups, and up to five cups of Red Rose (black) tea with milk throughout the day). I did not want to give up animal products; I thought that cutting out the other four will be drastic enough -- gluten in particular as I eat a lot of bread and pasta for example. Now into the third day I am glad with that choice. Sugar is not that hard for me to give up, though I consume more of it probably than I realize including in the generous helpings of peanut butter I tend to put on bread, as well as of course that bag of Twizzlers or Snickers bar. Still, I love fresh and dried fruit so that's easy to turn to. Alcohol is not that hard either, though I do love having a glass of red wine with dinner. However, a "common sign [of a weakened liver] is greater sensitivity to ... alcohol -- you might be called a lightweight. Your liver may not be strong enough to filter out toxins from the bloodstream completely, and so they effect [sic] you more powerfully than they would someone with a healthy, fully functional liver," Freston writes. Caffeine is by far the hardest one for me. "[C]affeine stimulates the central nervous system by tricking the brain into the release of excess adrenaline," says Freston. "This excess adrenaline in your body builds up in your muscles, creating body tension, headaches, and muscle spasms." While I rarely suffer from a headache, I have plenty of body/muscle tension. As Freston writes, giving up caffeine might cause withdrawal symptoms including headaches, irritability, lethargy, nervousness, and depression; that's a key reason I decided to simply drastically reduce my intake to 1 cup of coffee a day. Gluten is not something I have previously considered as something that was negatively affecting me. "A gluten-heavy diet may contribute to osteoporosis, anemia, and vitamin and mineral deficiences, primarily because the small intestine is too inflamed to perform its duty of absorbing nourishment," according to Freston. My diet certainly was gluten-heavy with lots of pasta and bread. "Each individual has a different sensitivity to gluten, but almost everyone suffers some irritation from it," Freston writes. As mentioned, I am not forgoing animal products this week. Perhaps another time, perhaps not. Breakfast is now: organic apple, raisins, walnuts (or almonds), shaved unsweetened coconut, greek yoghurt. An alternative breakfast, which can also serve as lunch or dinner, is a large omelet with veggies, here's a meal I made the other day. You need a couple of ‘regular-sized’ potatoes, 4 eggs, extra virgin olive oil, 1 onion, ginger (ideally freshly shaved), a dash of turmeric, 3 small tomatoes, and fresh cilantro. Peel the potatoes, slice them before cooking them until done. Cut the onion as finely as you like. Pour generous layer of virgin olive oil and heat in frying pan, then add the onion. Meanwhile, crack and mix the four eggs in a bowl, then add the potatoes, ginger, turmeric. sliced tomatoes and fresh cilantro, and add this mixture to the pan. When done, add (sea) salt and fresh black pepper to taste, and serve with cottage cheese. For dinner last night, I made a salad with buffalo and goat cheese (a variation of a recipe from Teresa's Reconnect with Food); I used fresh organic spinach, tomatoes, avocado, and sunflower seeds. I also added a bit of organic kale and fresh ginger. Another lunch or dinner I am having during this cleanse is a brown rice curry with chickpeas and veggies. The curry paste I'm using has been a staple in our diet for a while: Aroy-D red or green curry paste, as all the ingredients are natural. I use extra virgin olive oil to fry an onion, before adding a tablespoon of the paste, then chickpeas, veggies, and finally coconut milk. Serve with brown rice. 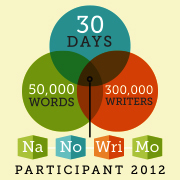 It's almost November, which means it's time for another National Novel Writing Month, or NaNoWriMo. If you've ever considered writing a novel, I highly recommend trying this annual nonprofit event that encourages kids and adults to tackle the challenge of writing a 50,000-word novel in one month. I'm planning to participate for the third time. In 2010, I wrote the first draft of what turned into From my Mother -- my first novel -- during NaNoWrimo. 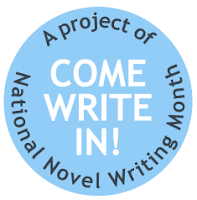 Like last year, I asked the Squamish Public Library if they were willing and able to support NaNoWriMo by offering a space for local participants to work on their masterpiece and they again agreed enthusiastically to host two so-called Come Write In events next month. So, if you're doing NaNoWriMo and find yourself in the neighbourhood on Saturday November 10 and/or Sunday November 18 any time between 10am and 2pm, join me at the Squamish Public Library to complete our daily word count together. "I thought you never wanted to do one of those again?" my dad said on the phone. Well, that's not quite true; I had thought more of it as, you know, maybe, possibly, one day. Since finishing my fifth Ironman in New Zealand in March 2005, I decided to focus on running, never looking back as I slowly and surely improved; earlier this year, at the age of 41, I ran personal records for the 10K, half marathon and -- most importantly -- the marathon at 3:00:29 (on a course that was later declared up to 400 metres long for the top finishers including me). What's more, I knew I could run faster. On a high from these results and greedy for more speed, I began a 10-week high intensity program with a coach 2-1/2 weeks after the Vancouver marathon in early May. Bad move. Disaster struck within a month, though it has taken me four months and counting to to realize the extent of it. In my 16 years of running (and including six years of triathlon) I have only suffered one previous major injury, an ITB problem in 2003. In the nine years since that injury, I have done three Ironmans, 12 marathons including 11 in 3:15 and faster, and completed five ultras without any issues that couldn't be fixed with a couple of treatments. So this mysterious pain that prevents me from running, even walking at times, and doesn't seem to handle driving well either, has been tough to deal with. While the symptoms are clear, it has proven hard to pinpoint and I still don't have a diagnosis. I do know that it hasn't responded to the Active Release Technique, Trigger Point massage and IMS (Intramuscular Stimulation) treatments I have received in the past four months; all were done by qualified and experienced professionals whom I'd recommend highly without hesitation. This week I am seeing a physician who specializes in sports medicine, in particular field hockey, football and running, and I am scheduled for an MRI on November 6 (it will be eight weeks since that request was made). The last few months have been challenging, and I've had to keep my mind in check. By and large, I remain optimistic though have found it hard to motivate myself for cross training, with swimming and cycling high on the list of recommended activities. I am a runner, I love to run. But I can't at the moment and have no idea when I'll be able to run again. Finally last week I got on my bike because I wanted -- needed -- to doing something. I realized that the last time my Argon 18 had been used was in Ironman New Zealand 7-1/2 years ago. Wow. I did my first triathlon, an Olympic distance in June 1999, and my last in March 2005. I now have been away from the sport for a longer period of time than I was in it. In 2005, I simply stopped riding my bike and gave up swimming without too much regret to focus on running. As my passion for running grew it erased any interest I had in a return to triathlon, though I have remained closely involved in the sport through Tim's training and racing, friends, and my work as a writer and editor. While I certainly wasn't compelled to swim or ride, I have kept all my triathlon gear (bike, wetsuit, clothing) except for my Zipp race wheels; Tim discouraged me from selling the carbon bike used only in preparation for and racing at IM NZ, even as it simply sat there gathering dust. "It's unlikely you'd ever buy a bike of that quality again," he'd say. "Besides, you'll never get your money back in selling it." "But what if I never ride it again?" Then Ironman Whistler was announced. An Ironman around the corner. With 100 Kona slots. Of course Tim signed up on Tuesday, as did a neighbour and other friends both locally and overseas who had registered for priority entry. The thought of signing up had crossed my mind, though I dismissed the idea very quickly. Or so I thought. When general online registration opened Thursday at noon, I found myself filling out the entry form; my fingers were typing even as my brain was thinking, No, absolutely not, NO WAY. Fear is powerful. Fear can be paralyzing. It also can propel you into action, and disappear when you challenge it. I couldn't deny the excitement I felt; the familiar thrill of wild abandon in committing to a clear goal that is as electrifying as it is terrifying. Giddiness that trumps all reason and rationale; a gut feeling that something is completely logical in its inherent craziness and that, despite trying very hard, is impossible to ignore. I paid my $736.31 accepting that I may discover over the next few months that I am no longer cut out for triathlon, that the desire and excitement for Ironman training and racing remains overshadowed by the fear of mass swim starts and riding big downhills, fears that I dealt with in each of the five Ironmans I did between 2002 and 2005. Or, as I hope and expect, I may find myself a triathlete again, loving the feeling of supreme fitness that comes with training in three disciplines. IM Whistler is here, now. And so am I. So why wait? What would I be waiting for? Turning 45, 50, 55 or 60? If I don't want do Ironman now, why would I want to do it later? Let's do it now. At least I'll finally have some powerful motivation to get back on my bike (the windtrainer until next spring) and into the pool; if nothing else, there will be good crosstraining ahead while I search for the answer to my running injury. I met Frank Smith at one of the monthly meetings of the Squamish Writers Group almost a year ago. It was November 2011. The monthly assignment was to write on the topic of Gravity, and I wrote mine with running in mind. At the end of the meeting Frank and I chatted about running, and writing of course. Since I drive from Valleycliffe to the meeting downtown at the office of Goodwin Studios (owned by local poet Jude Goodwin) and Frank was always on foot, I'd offered to drop him off at home in the winter months. He always declined, saying he lived very close. I recall that after one meeting it was absolutely pouring, and he again declined my offer of a ride, repeating that it was close and that he liked walking in the rain. Made a lot of sense to me. What I didn't know was that he was homeless for a while. I regularly bumped into Frank at the local library, or at Nexen Beach where I'd be walking Luka, and he'd be running, and we of course met at the monthly writers' meetings. We'd always have a chat, which typically included running and writing. He mentioned he was reading my blog and enjoyed reading about my training and racing. He told me he'd first started running in 2008, ran off and on for a while, then stopped, and picked it up again at about the time we first met at the writers group. He'd never done a race and said he couldn't help but read the references on my blog to PB as peanut butter, rather than personal best. In our chats, it soon became clear that Frank is a highly intelligent, gentle and quirky soul who always has a fresh point of view to offer. He's got a good sense of humour too. Tim, Luka and I ran into him again at Nexen Beach just after I shaved one side of my head; Frank instantly noticed the new do and said that it looked good. When I mentioned it had drawn a couple of strange comments, he said that one of the things he liked most about living in Squamish where he moved in 2011 was that most people here were so different that he'd never felt more at home. I liked that. 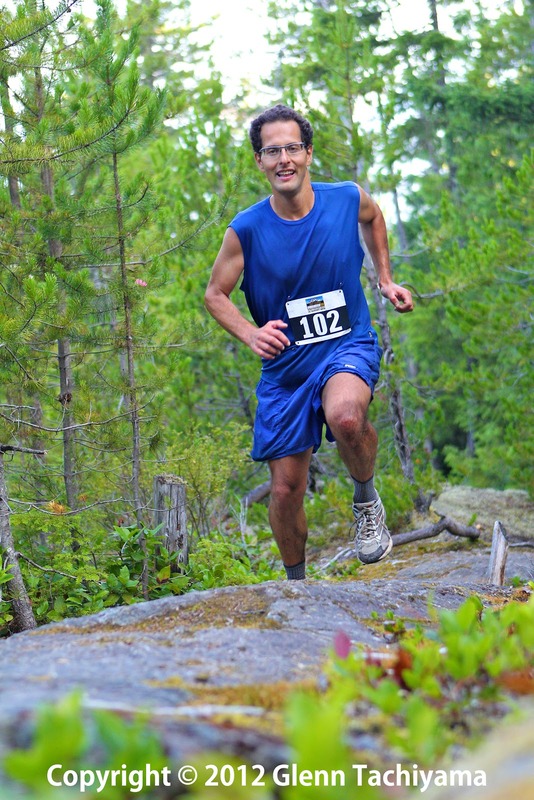 In late July Frank said he'd signed up for his first race, opting for the Squamish 10K. This certified 10K, held every first Sunday in August, took him 41:19, placing him second in the men's 30-34 age group. High on this superb result, though he didn't realize how well he did, he asked my advice about signing up for another race the following weekend: the Squamish 50. Miles that is. I asked him for more details about his recent training. He said he'd been running regularly again for the past nine months as he'd slowly ramped up the volume. "In the last couple of months, I've generally run twice a day, for around 30-60 minutes per run. On weekends I often go on a 2-3 hour run, as well as regular running—sometimes my long run might go to 4 or more hours. On occasions when I feel too sore to run, I take a day off. Much of my running is on trails, although I also do some road running. I guess the above totals something like 10-15 runs a week, for 10-15 hours," Frank said. While cautioning him with the general advice to run regularly for at least a couple of years before even attempting training for a marathon, let alone an ultra without preparation, I also told him that based on his training I expected he'd be able to cover the 50-mile distance. Arguably, a trail ultra is easier on your body than a marathon on the road. However, undulating trails take more time and of course a 50-miler is nearly double the marathon distance. I also advised him to allow plenty of recovery time afterward. 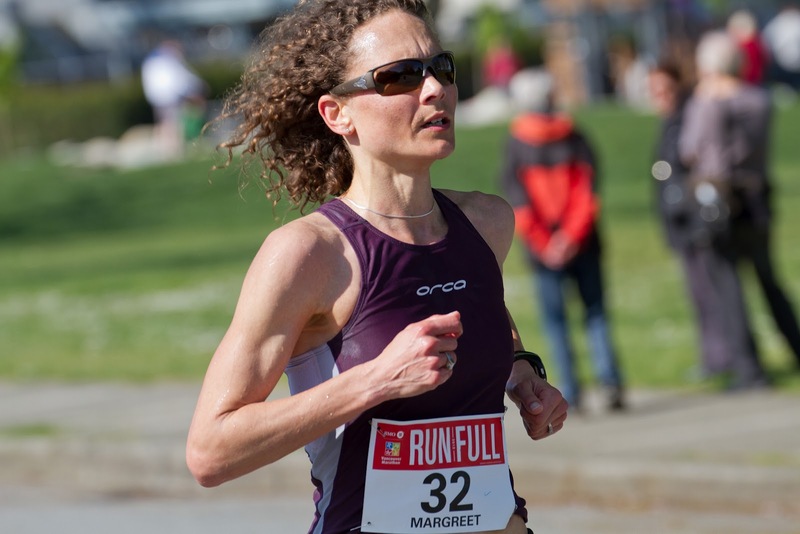 Me: One of the key questions that intrigue me when people start running is why, how does it feel, and what is it that this runner connects with? I don't think everyone can answer those questions immediately and I think the answers change over time. And I believe that in many ways we don't have access to the rationale that explains our drive completely, but it's always an interesting journey to try and understand that what we do realize and highlight the questions to which we might keep looking for an answer. Why does a guy start running in his 30s, and opts to begin with a 10k road race, followed by a 50-mile trail race? What is it that you have discovered in your running travels so far? Of course time is always an issue, so feel free to pick and choose questions to answer. Frank: "Why?" is a big question in a little word. Lots of reasons contribute, although of course some more prominently than others. When I started running, I had quit smoking and found myself walking off a lot of newfound energy. I tried running, and found that it helped me in a lot of ways. How does it feel? The feeling varies, ranging from ecstatic through bored and desperate. Part of the appeal of running has to do with the variety of emotions it triggers, many of which tug at very human roots. What does this runner connect with? The ground! Joking aside, running does help ground me. I find that after a lot of abstract considerations, running really pulls me back to basics. You can only get so theoretical when you have to make an effort to breathe and move, such fundamental forces. I also like to experience the different places and times that I go through while running. I find that every mode of transportation exposes different aspects of geography, for example. When I go for a run, I see and hear and smell and taste and feel things differently. I strongly agree with your comments about the difficulties of answering these questions. My reasons for taking up running recently include its accessibility—anyone can run, it doesn't require specialized equipment or training or facilities. Running affords many opportunities, including physical and intellectual and social options. I mostly got into running for reasons having to do with overall health rather than athletic performance, so I didn't think much of racing. Recently some friends encouraged me to race. I had run considerably longer distances than 10K, but wanted to start with a race I could confidently finish. After that, I wanted to try a long trail race, and the Squamish 50 happened. I had never run that far before, and I didn't know if I could do it, but with some excellent expert advice beforehand, I managed to prepare for the race and run it while having fun! (By the way, regarding the phrasing of your question, I technically wasn't in my 30s when I started running— you could say I started racing in my 30s). Have you always been athletic; even if not in a 'formal' sense, can you describe the sports and/or activities you did growing up? I was never really athletic, although I generally liked casual athletic activity and had a little bit of ability. Growing up, I played a number of North American team sports. I preferred using my arms more than my legs. I did a small amount of formal athletics but mostly played casually. You mentioned you first began running in 2008? Why? Who/what inspired you to do that? Did you intend to "become a runner" or was there another reason to try running? When I started running, I had, as I say, quit smoking. Running helped me keep me my mind off smoking, and I found that it also gave me a chance to get away and think. Of course, running also improves physical fitness and I felt better. I felt motivated to eat better, and the combination of overall improvements got me to keep running. As I ran more and learned, I found many sources of inspiration. Terry Fox stands out. I did not intend to "become a runner". For me running has been about distinct aspects from the identity. I tried running for a number of reasons including the accessibility and the health benefits, so I didn't really get involved with "running culture" as many people do. More recently I have given some of the common running practices a try. I never thought of myself as "a runner", and I still don't. That caused a few surprises when I would discuss relatively long runs, then mention that "I'm not really a runner". After the Squamish 50, I felt like maybe I should stop saying that "I'm not really a runner", but I still don't think of myself as a runner. I'm a casual ultramarathoner. What exactly did you do? For example, how long did you run initially and how far did you get eventually? How often did you run? Did you run with anyone? Got advice through friends, coaching, books, websites, anything? When I decided to run, I didn't have any running shoes, so I just ran in the non-athletic shoes I had. I got a little distance before feeling winded and sore, and I couldn't believe how anyone could run for five minutes at a time! After that, I looked up a few basic pointers online, and went out for runs periodically, each time trying to increase my distance. After a while I could run for a couple of hours. I enjoyed going for runs without routes or times or other runners. When did you realize you liked it running? What was it that made you realize you liked running? Or perhaps did you not get there yet until more recently? I realized I liked running when I had planned to go somewhere but wanted to keep running instead. Running had replaced other interests in appealing to me. With running as a rewarding activity in itself, I made more time for it. I have found many more reasons to like running, including places, people, thoughts, and events. You mentioned you then ran off and on for a while, before stopping altogether. Do you remember that timeframe more specifically, so how long did you run more or less consistently (assuming you did at the start), and then why did you run a little less before taking a break altogether? I ran fairly regularly for a while, I don't remember exactly how long. A number of events have popped up that have prevented me from running for various amounts of time. When did you resume running again, what triggered it? What did that new start look like, as in what training did you begin with, and how did you build up to running as you describe close to the Squamish 50. What made you stick with it? Did you like running better this time around, or did it feel different? After not running for some time, I decided to give it another try. I started off slowly, aiming to maintain a limited amount. As I kept running I found that my endurance grew better than I expected. When I met you, I found inspiration in running and writing and living. I turned around my running and went for longer, better runs. I learned more about training and nutrition and many other aspects. At some point I also started running with the Squamish Trail Running Club, where I ran with other people, learned more about running, and learned about local trails and courses. I kept running for lots of reasons. I liked it, I made many new friends, I still wanted the health benefits, and it gave me good chances to get out. I felt better this time around, enjoying it more and running more smoothly. Describe a typical running week for you as it was in the month before the 10K and the 50-miler. In the month leading up to the races, I generally ran a couple of times a day on weekdays, going for half an hour or an hour at a time around the trails in my neighborhood. On weekends I would often go on longer runs, either with the Squamish Trail Running Club or on a solo adventure. I wasn't specifically training for the races, I would go on runs through scenic areas or with interesting people. What prompted you to sign up for the Squamish 10k? What was your frame of mind going into that race? Some of my friends encouraged me to try a race. I thought I might next year, but Squamish Logger Days came up and I thought the 10K offered a good chance to have fun and try a race. It was my first race, so I just wanted to finish and find out how an actual race would go. I was sleepy at the start, and I felt nervous excitement, then I ran the race. Describe that 10k experience, from start to finish, and how it compared with your expectations? What was it like to race? Did you sense how fast you were? It took me some time to get into the swing of things. I ran faster than I usually would, and I struggled to make the race go well. In the latter part of the race, I fought some bodily urges. Then, approaching the finish, I had trouble discerning the actual finish line. I finally crossed, ran off a bit farther, then lay down on the grass for a while. I found a lot of the other runners quite impressive, and the overall experience quite interesting. The race changed the running experience qualitatively from my usual runs. I focused considerably more on running mechanics. I generally prefer my casual runs but I'm glad I experienced the race. Now how did you go from finishing your first race ever, to signing up for a 50-miler a few days later? Had you toyed with that idea earlier? What brought you to that? How did your mind work? It's a fairly unique progression for a runner. What gave you the inner courage to attempt it and what did you hope to find? Around the time of the 10K, I saw some signs for the 50-miler. I had previously thought of running a trail race. After the 10K I still wanted to do a trail race, so this seemed like an opportunity. I had figured on trying a trail half-marathon, and some friends had invited me to join their trail relay team. I considered those options, as well as the 50-mile race. I thought running the ultra would be funny. It was! I signed up at the last minute, I had to go through some hurdles to get the payment processed and move from the waiting list to official entry, but I managed to sign up. I went out of town during the week leading up to the race, then got on a funny schedule right before the race, and finally got to the start line. I had never seriously considered running an ultramarathon before. I didn't even know if I could physically run a marathon, let alone an ultramarathon. I wanted a challenge, and this seemed appropriate. Don't ask me how my mind worked! I asked you about the race, and you provided some immensely helpful information. I thought about the race, and read a little bit about ultra running. Based especially on your words and on previous experiences, I felt confident that I could try the race. I just hoped to finish. Talk us though the race, beginning with your mindset in the days leading up to the 50-miler, and race morning. Leading up to the race, I thought I would find a new type of race where I didn't know what to expect. Would my legs last? Would I want to keep going? Would I even manage the race procedures? The beautiful dawn sky promised an exciting day of running ahead. I live near the race start, so I arrived on foot. At the entrance gate the attendant asked approaching drivers whether they were going to the race, but thought I was just out for an early-morning walk. Everything had the air of novelty for me, and I talked about the race with some of the other runners gathered before the start. We set off, and I felt pretty good early in the race. As we got into the higher elevations, my legs started to hurt earlier than I expected. I pushed through, and after a while I felt better again. My worn shoes fell apart, making it increasingly difficult to run. Later on, my body hurt again, including muscles that had never felt sore before. I accumulated a collection of scrapes and cuts and bruises. Rounding back near the finish line, I gained a fresh burst of energy, and picked up my pace again. After crossing the finish line I felt like running more. I then danced for a bit to celebrate the finish. I wanted to lie down but thought it might be hard to get back up. The volunteers and spectators lining the course dramatically improved morale. I knew some of the course from my previous runs, while other parts were new to me. The race had a different feel than either my usual runs or the 10K. Again, I prefer my usual runs but appreciate the experience. I did relatively well on a variety of terrain including downhills, straightaways, and moderate uphills, but lost ground on the steepest uphills. 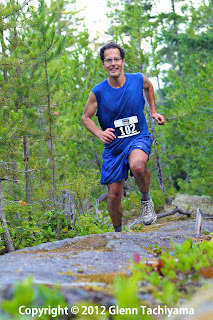 Squamish features some amazing geography, so the race was spectacular to run. What were some key thoughts you had during those 50 miles? What was the highlight? How did the finish feel? I had a great time. Some thoughts during the race included how parts of the course felt, figuring out if I could finish, and taking in some of the surroundings. Highlights include starting to run, running rapidly uphill around halfway through, and running across the finish line! I also liked to talk with people and think about the race before and after running. The finish felt like a successful accomplishment, although taking some time to sink in. And now that you have had a couple of weeks to absorb the experience, what are your thoughts? Has it only been a couple of weeks? It feels like a lot longer than that. I'm really glad I did it, and mostly thankful to all the people who made it possible. I think that solo running is very much a team sport! I'm especially grateful to you for your irreplaceable excellence. What are your running plans now? Have your resumed running - talk us through your recovery? I haven't gone running since then, so maybe I'll never run again! It took me a week to recover enough to feel solid again. I've done some other activities, and I figure I'll probably run again in a little while, but for now I'm happy that the last time I went out for a run it went for 50 miles! What have been the key changes in you through running and when did you notice them occurring? I think running induces improvements to the body and mind. I feel better and I think better. I've now met lots of great people through running, and I've seen interesting places. For my personality I think that running helps emotionally, as well. For such a tangible activity as running, a lot of its effects are intangible. I think the changes started to happen very early, and grow with time. How has your running influenced your writing, what specifically? Running helps to formulate ideas, to express them, to intermingle different streams of thought, to clarify uncertainties, and otherwise to sharpen writing. Running also encourages patience, focus, strength, and other useful skills for writing. Running in different environments opens the mind to new ideas. Running with different people helps to communicate. I think that running and writing share a lot in common, and for this reason there are a number of people who both run and write. What do you consider your key discovery as a runner so far? I think my key discovery as a runner so far is that running helps to manage with many other aspects of life. Within the last year, I was homeless. To go from homelessness to running an ultra in the space of a year shows how things can change. In mentioning the accessibility of running, I could run without huge costs. A lot is possible. I'm very grateful for all the people whose help gave me a chance. It has been eight weeks since I finished the Scotiabank Half Marathon in 87:02. Later that day, my body signalled something was seriously wrong, and I needed to pay attention. Nine days off running, stretching in Bikram Yoga sessions, didn't help to fix the problem. My superb sponsors at Chief Chiro, Drs Leah Stadelmann and Paul Fleming, have since been working tirelessly with Active Release Technique treatments as well as some adjustments (chiropractic moves). Their support, treating me two or three times a week, has been nothing short of fantastic. Dealing with an injury, my first in nine years, is mentally draining. As things like Achilles tendinitis, tendinosis, tendinopaty; and plantar fasciitis, were thankfully ruled out, expectations were for me to be able to return to training relatively soon. While there is definitely progress, the pace has been slow. Long story short for now, the key symptoms occur on the inner (medial) side of my right heel, varying from a pulling sensation to outright pain. While I have been allowed and able to do some running, Leah and Paul have also encouraged me to turn to the pool, especially now that it's become increasingly clear that it's a stubborn problem. Two days ago -- emotionally exhausted from starting my outdoor runs full of hope before my heel reminded me, typically within 20 minutes, that my body is not quite ready yet -- I finally decided to commit to the pool, very much encouraged by Leah the previous weekend, and inspired by this nine-week Pete Pfitzinger water running program I found online (here's an accompanying article). "To get through the doldrums of your non-running days, you need a schedule that provides structure and poses a challenge. With this program, you don’t have to worry about losing fitness -- if approached aggressively, you may come out of the water fitter than before your injury," Pfitzinger writes. As it turns out, our pool has a great selection of water running belts including the Aquajogger. A 10-visit pass was also easily purchased for $40. With this program, the dread of running in the pool became a lot easier to deal with; specific, short, challenging sessions that cover a full nine weeks. I am glad I overcame my initial reluctance, even if I am still hopeful I won't need to complete the entire program. But if I do, at least I have something to keep me focused. In The Art of the Personal Essay, Phillip Lopate writes, "To essay is to attempt, to test, to make a run at something, without knowing whether you are going to succeed.... One would like to think that the personal essay represents a kind of basic research on the self, in ways that are allied with science and philosophy." On Wednesday, three days ago, I changed my look by shaving off the right side of my hair. I am far from the first woman to try the sidecut or undercut -- in fact I am far behind the curve, if anything. In recent months I had seen two women sporting this hairstyle on The Voice and Duets (yes, I freely admit to watching reality singing competition shows), Lindsey Pavao and Jordan Meredith. Cyndi Lauper and Salt N Pepa had sidecuts in the 80s. More recently UK model Alice Dellal took this look to the catwalk, while Rihanna has looked pretty fabulous with both her long and short versions of this look. While it's hardly a unique hairstyle, perhaps even mainstream, shaving a part of your head looks and feels a little radical. I didn't do it on a complete whim. The right side of my hair is not as full as the left, which has been annoying me for a few years, and I had joked that a sidecut would rid me of that problem. Before going ahead on Wednesday with this drastic cut and shave -- after all it will take a few years before the shaved side will grow back to shoulder length -- I did some googling to make sure it was what I wanted and, if so, to pick up a few tips on how to do it. I watched a few videos on Youtube of women doing their own sidecuts which, aside from some useful practical tips, also give you an idea of the range of the emotions you'll go through during and the process. Somewhat to my surprise, Tim was supportive and encouraging. Now that my sidecut is done, I can't believe I did it; I like it, but it stands out without a doubt and I cannot help but wonder why I chose to do this. It's only hair, of course, but growing the shaved part back to blend in with the length of the rest of my hair will take forever, especially with my curls. So, unless I go for the full head shave -- which I certainly don't plan on doing again, though I did, and enjoyed, that carefree do a little over a decade ago -- I will have my new sidecut for a while to come. I did it because A.. I simply felt like it and B. I could. It was a gut feeling; even as I changed my mind a few times after choosing and putting the section I would cut, and then shave, into a ponytail, I still couldn't stop myself. Tim recommended I go for it, somewhat to my surprise. Like the woman in the video, I first cut a shorter part of the ponytail - that brought it from shoulder length to just underneath my ear, getting rid of about 5 centimetres of length. Here I paused and considered stopping there, and simply bringing the rest of my hair in line with the new length which would have been a very high bob. I knew I wanted the sidecut, even as I was scared to do it. Tim recommended I proceed as planned, so I did. Then there was no turning back. The sidecut felt liberating and terrifying at the same time. Cool, I did it! Why did I do this? I don't recall a specific trigger for change that day, though the month of June has provoked much introspection. It is probably a symbolic culmination of everything I've thought about in the past month. It's only hair. But hair is important, and I'd like to explore the reasons behind choosing my new hairstyle because I think it will help me understand a few other things. "Our hair is one of the first things others notice about us and one of the primary ways we declare our identity to them," Rapunzel's Daughters: What Women's Hair Tells Us About Women's Lives author Rose Weitz says in a 2004 Arizona State University article. "It is personal, growing directly out of our bodies," Weitz, a sociologist at ASU, wrote. "It is public, on view for all to see. And it is malleable, allowing us to change it more or less at whim. As a result, it's not surprising that we use our hair to project our identity and that others see our hair as a reflection of our identity." "If you want to understand the importance of hair, talk to a woman who doesn't have any. You'll quickly learn, as I did, that losing one's hair can feel like losing one's very self," Weitz writes in Rapunzel's Daughters. "Sometimes that's the point. In other times and places, Bhuddist priests, Catholic nuns, mental patients, prisoners, and soldiers have had their heads shaved to strip away their identity." "For nuns, priests and (volunteer) soldiers, this can be a welcome change, marking a fresh start as a longed-for future turns to reality." When I decided to cut my hair from well over shoulder-length to as short as it can be cut with a pair of scissors at the end of 2000, I hadn't given my motivation much thought. It seemed like a cool change. It was just hair. Right? Wrong. "Women who more freely choose baldness speak even more positively of it as a means of finding and expressing their identity, or of ridding themselves of a hated problem -- be it wayward hair or men's attentions," Weitz also wrote. "The sheer glee with which they recount the experience of shaving their heads suggests that maybe we should all try shaving our head at least once." As I learned following my hair cut, followed by several short shaves, about 10 years ago, a woman with very little hair becomes a different person, changes her identity, whether she likes it or not. I plan to explore my drive, a woman's motivation, for the partial shave in writing through a personal essay, as defined by Lopate above, "a kind of basic research on the self, in ways that are allied with science and philosophy."